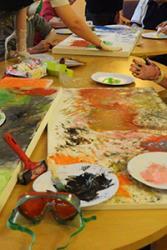 Mixing colours in one of the workshop sessions in a care home. Health professionals from across north Wales are set to benefit from the experiences of participants in a major UK Dementia and Imagination project, led by Bangor University, as the first workshop takes place in the region. People in the Ruthin area who have dementia, have had the opportunity to work with artists as part of a large research project taking place in north Wales, the North east of England and Derbyshire. The comprehensive research is assessing the extent to which art can help people live well with dementia and stay connected with their communities. Leading experts in dementia care research at Bangor University are at the forefront of the research project, which also includes other influential organisations including Age Watch, the Alzheimer’s Society, the Welsh Arts Council and Denbighshire County Council. At the session on 23 June, professionals working with or arranging services for people with dementia will gain first-hand experience of the activities that have been offered in care homes, NHS sites and community venues as part of the research. 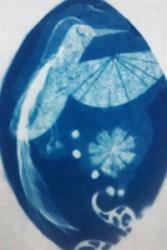 Experimenting with cyanotype in Denbighshire. The Workshop has received funding from the Connected Communities Programme, which is building powerful collaborations between researchers and communities to generate distinctive research insights on the changing role of communities in sustaining and enhancing our quality of life and to produce legacies of value for both future research and for communities. The Programme is led by the Arts and Humanities Research Council (AHRC) in partnership with other Research Councils and a range of other organisations. Each year Connected Communities presents a showcase of its research for the public to find out more about current projects and activities. This summer, the showcase has become a nation-wide event as part of the AHRC’s 10th Anniversary, with a series of activities taking place between the 15th—29th June.